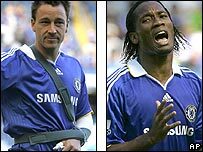 Chelsea hope John Terry and Didier Drogba will recover from injury and the pain of losing the Premier League title to play in the Champions League final. Terry dislocated his elbow and Droga suffered a knee problem in the 1-1 draw with Bolton as Manchester United clinched the title with a win at Wigan. But both are hopeful they will be fit to face United in Moscow on 21 May. Terry insists he will play, but Chelsea boss Avram Grant said: "Drogba doesn't look so good, we'll have to wait." Chelsea captain Terry was stretchered off after a collision with goalkeeper Petr Cech after only 11 minutes at Stamford Bridge and said: "I should be fit for Moscow, fingers crossed." Terry said his elbow was "popped back in" while in the ambulance and he added: "I need three of four days rest but I should be fit for Moscow." Chelsea boss Grant added: "He's strong enough to recover, but you never know. "We need to wait and see how bad it is. We will know better in a couple of days. "If it was down to his character he would be sure to play, but it's up to the medical team." Grant was gracious as he conceded the title to United - but immediately set his sights on the "dream" encounter with United. He said: "Getting to the final was our target. When you get there, you want to win it. We want to win it. We wanted to win the league also but it was never, for one minute, in our hands. "We have finished the league and now we are waiting for a game we have dreamed about. We don't want to go the final to be part of it, we want to win it. "The players gave everything but when they heard it was 2-0 to United, the last 10 minutes was for the protocol and then we conceded a goal. "But in the last months we have developed our football and the last game of the season in Moscow is one we want to win."